The Mohammed movie and the embassy attacks: Romney betrays free speech. 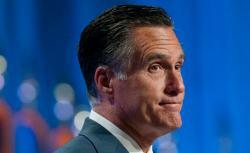 Romney’s condemnation of U.S. diplomats over the Mohammed movie is a betrayal of free speech. Mitt Romney addressing the 2012 National Guard Association Convention on Tuesday. Mitt Romney says the U.S. Embassy in Cairo has betrayed “American values.” He’s wrong. The embassy is standing for American values. It’s Romney who’s betraying them. When you read the tweets alongside the initial statement, the message is clear. Free speech is a universal right. The Muslim-baiting movie is an abuse of that right. The embassy rejects the movie but defends free speech and condemns the invasion of its compound.